Click on the thumbnails below for information on books currently in print. by Roy Sennett & Edward Sennett. Edited by Michael Smith. And most importantly, comprehensive listings and over 900 images of some of the most sought after postcards in Canada. 8.5 by 11 inches, laminated soft cover, spiral bound, 244 pages with a lavishly illustrated biography of J. W. Bald, 1200+ postcard listings, 900+ illustrations, and everything in full colour! Postpaid to a USA address: US$70. Cheque, Money Order or Interac® e-Transfer preferred. Born in Lunenburg in 1862, W. E. Hebb moved to Halifax at age 18 to work for the Nova Scotia Printing Company. It was here that he first demonstrated an uncanny ability to excel at all of his endeavours. His list of accomplishments in business, and his devotion to the public good would be hard to match today. •	Terrific views of Halifax daily life, the city’s thriving businesses, the arrival of immigrants, etc. •	Beautiful patriotic, military and novelty postcards. •	A stunning series showing the Newfoundland sealing fleet. •	Scenic views of Lunenburg and other historic towns in Atlantic Canada. BOOK DETAILS → 6.75 by 9 inches, laminated soft cover, spiral bound; 120 pages overall with: W. E. Hebb’s life story, family photos and other memorabilia, a breakdown of 17 different series of Hebb postcards printed in Canada and abroad, and every page in full colour! PRICE AND ORDERING → Regular Retail Price: C$39.95; Postpaid to a Canadian Address: C$44.95; Postpaid to a USA Address: US$44.95; discounts available to booksellers and those making bulk purchases. Cheque or Money Order preferred. ‘The Reuben Sallows Picture Postcard Handbook‘ by Mike Smith and Larry Mohring. A ‘Canadian Photographic Genius’, Ontario photographer Reuben Sallows (1855–1937) is little known outside of Huron County. From his Goderich studio in the 1890s, he became a master photographer of local folks in their natural surroundings. His stellar outdoor photos caught the eye of magazine publishers, railway companies and government ministries. This handbook links as many antique postcards as possible to their original Sallows photograph. Full colour, laminated soft cover, spiral bound; 8.5 by 11 inches, 310 pages including a lavishly-illustrated biography of Reuben Sallows. 1800+ postcards catalogued by publisher and 1300+ illustrations. Click on the thumbnails below for information on Mike Smith’s recent books (currently out of print). This second edition updates The Canadian Patriotic Postcard Checklist published 10 years ago. 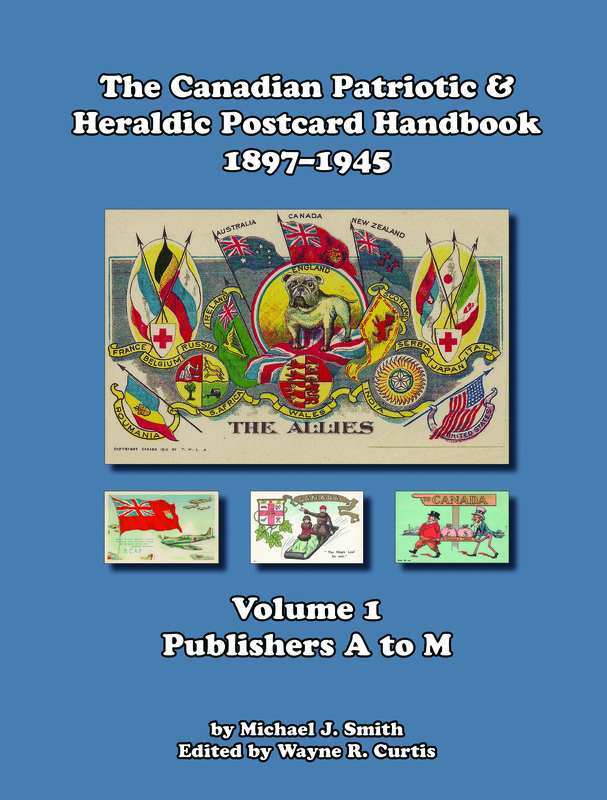 Improvements and additions include; expanded date range to include postcards from Queen Victoria’s Diamond Jubilee to the end of the Second World War, inclusion of heraldic (semi-patriotic) cards, hundreds of newly-discovered postcards, 700 additional card images and 60 more pages, increased size of postcard images, updated value categories. Full colour, soft cover (laminated), spiral bound, 8.5 x 11 inches, 438 pages. Mike’s Canadian Patriotic & Heraldic Postcard Handbooks are a must-have reference to Canadian Patriotic Postcards. This second and final volume contains almost 2,000 full-colour images, lists and value categories to educate and entertain both the amateur and seasoned postcard collector. 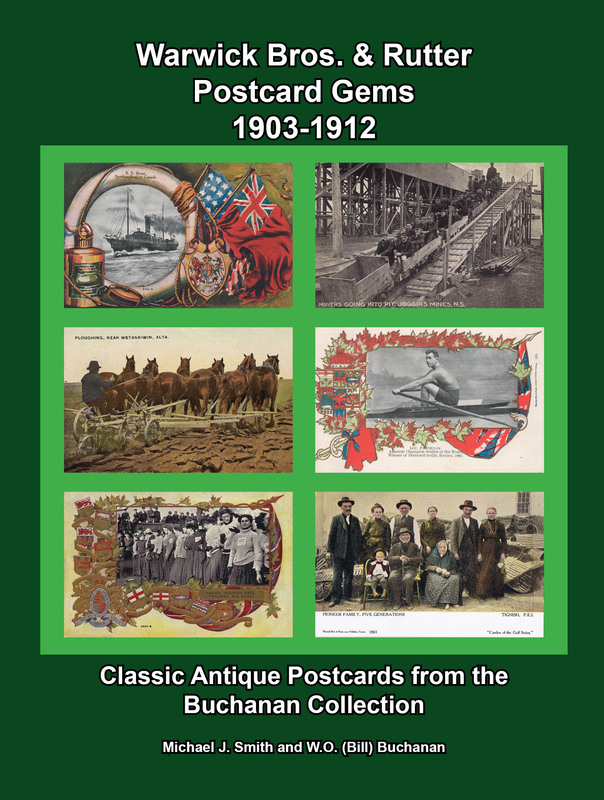 Includes abridged business histories of some of Canada’s most important postcard publishers, over 60 series of postcards from anonymous publishers, and the largest listing of patriotic & heraldic postcards from Valentine & Sons and the Photogelatine Engraving Co. ever published. W.G. MacFarlane was one of Canada’s most prolific publishers in the early part of the 20th century. This handbook has something in it for everyone. Showcasing the variety and quality of MacFarlane postcards from Patriotic, Heraldic & Royalty Postcards (39 series) to artist-signed, novelty and 52 special series postcards. 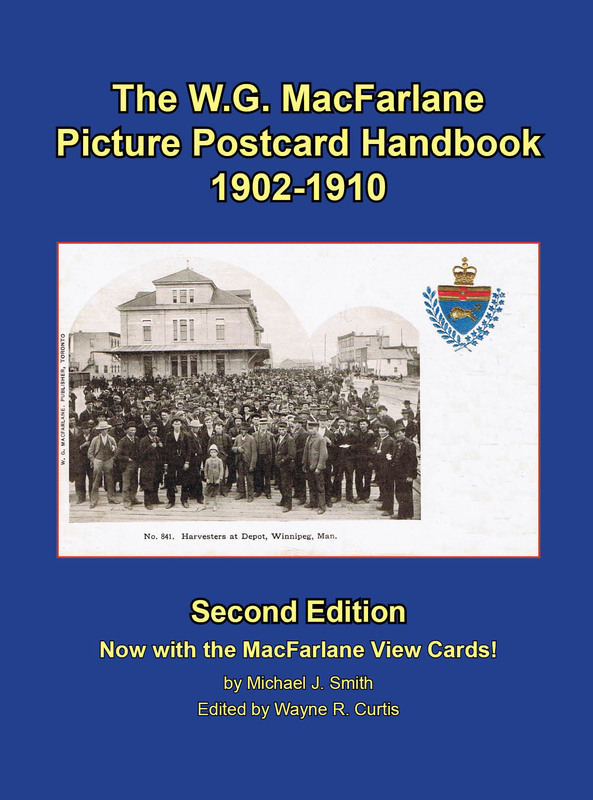 This 2nd edition includes over 1400 MacFarlane regular view cards and 12 new “fancy” series. Also includes 60 designs of MacFarlane back types and an Index of Cities and Towns, 12 pages in glorious colour, a price guide and earliest known usage for each series. Soft cover, 6.75 x 9 inches, 238 pages (12 in colour). Published in conjunction with the sale of the finest Warwick Bros. & Rutter postcard collection ever assembled, this book is a visual treat for both collectors and historians. Includes hundreds of images of the “gems” from the W.O. Buchanan collection such as; the legendary Warwick patriotic and other “special series” cards, artist-signed, classic views of railway stations and trains, ships, liners and ferries, early automobiles and stage coaches, sports and recreation, advertising, businesses, factories, Mounties, militia, the clergy, First Nations and Acadians. Appendix of unlisted postcards that have surfaced since the 2007 issue Warwick Bros. & Rutter Postcard Handbook. Laminated cover, 8.5 x11 inches, 106 pages. Mike Smith has been an avid collector of Canadiana for most of his life. One of his passions is collecting, researching and writing about Canadian antique postcards. In 2003 Mike authored The Canadian Patriotic Postcard Checklist 1898−1928, a handbook listing what he thought was nearly every Canadian patriotic postcard published in that 30-year period. Of course, publishing that book led to a slew of new discoveries, and ever since then, Mike has been stalking those elusive cards that escaped the first edition, and authoring a wide range of other postcard books, many of which are listed here, and are available for sale.